Frankie Dettori is to leave Godolphin after being retained rider to Sheikh Mohammed's operation for 18 years. 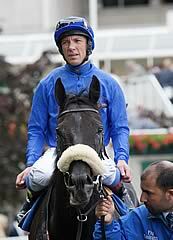 The popular jockey rode nine English classic winners for Godolphin and partnered the super Dubai Millennium to victory in the Dubai World Cup back in 2000. He won the sports richest race three times in total. Now though, Dettori is ready for a new stage of his career, but had nothing but good things to say about Godolphin: "I have had 18 wonderful years. Godolphin has been a major part of everything I have achieved in racing and I have loved every minute of it” He said. "I feel the time has come for a change. My position in the stable has changed a little bit and I need a new challenge. "Sheikh Mohammed has been an unbelievable boss to me. He had the confidence to take me on board when I was young and we smashed every record together.” Dettori added. Dettori joined up with Aiden O’Brien in the Prix de l'Arc de Triomphe to ride Camelot earlier in the month. He has been sharing rides at Godolphin with Mickael Barzalona and Silvestre de Sousa, who will both continue to their roles next year. A number of Dettori’s big winners have been trained by Saeed bin Suroor, including four of those which included the ‘magnificent seven’ back in 1996. The pair were both in Milan over the weekend as the 41-year-old partnered Group One Gran Premio Del Jockey Club Italiano at San Siro. The decision for Dettori to move on could have surprised a number of people, but it seems as though everyone at Godolphin is wishing him all the best in the future. Even if you prefer betting on Free Fruit Machines, you cannot deny just how brilliant he has been. The Italian is regarded by many as one of the best jockeys in the world and everyone in horse racing will be waiting to see what his next move in the sport is. Whatever he does, you can be sure that Dettori will continue to entertain supporters and win races, as that is what he does best.